This report provides an overview of 2014 marine water quality and conditions and associated biota in Puget Sound from comprehensive monitoring and observing programs. The report focuses on the marine waters of greater Puget Sound. Additional selected conditions are also included due to their influence on Puget Sound waters, such as selected climate indices and conditions along the outer Washington coast. 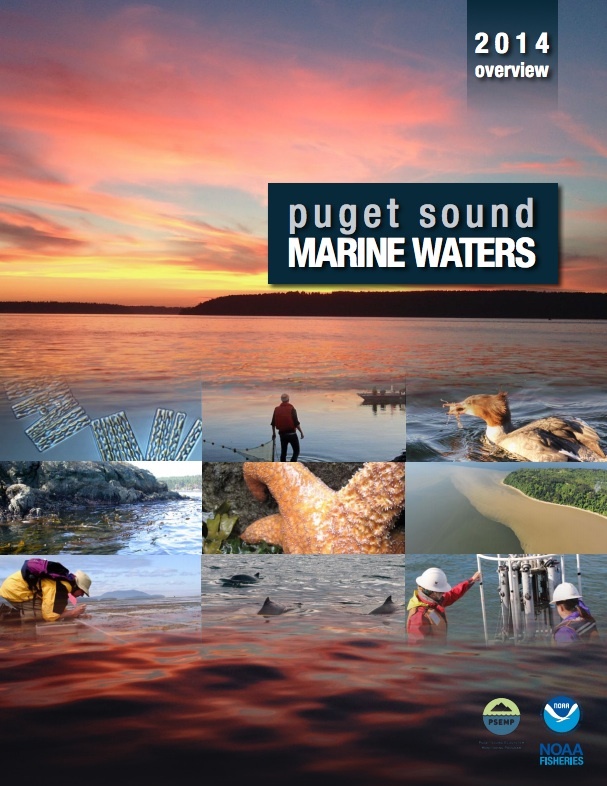 This is the fourth annual report produced for the PSEMP Marine Waters Workgroup. The objective of this report is to collate and distribute the valuable physical, chemical, and biological information obtained from various marine monitoring and observing programs in Puget Sound. Based on mandate, need, opportunity, and expertise, these efforts employ different approaches and tools that cover various temporal and spatial scales. For example, surface surveys yield good horizontal spatial coverage, but lack depth information; regular station occupation over time identifies long-term trends, but can miss shorter term variation associated with important environmental events; moorings with high temporal resolution describe shorter term dynamics, but have limitations in their spatial coverage. However, collectively, the information representing various temporal and spatial scales can be used to connect the status, trends, and drivers of ecological variability in Puget Sound marine waters. By identifying and connecting trends, anomalies and processes from each of the monitoring programs, this report adds significant and timely value to the individual datasets and enhances our understanding of this complex ecosystem. We present here that collective view for the year 2014. The data and interpretations presented here are the proceedings of an annual effort by the PSEMP Marine Waters Work Group to compile and cross-check observations collected across the marine waters of greater Puget Sound during the previous year. Data quality assurance and documentation remains the primary responsibility of the individual contributors. All sections of this report were individually authored and contact names and information have been provided. The editors managed the internal cross-review process and focused on organizational structure and overall clarity. This included crafting a synopsis in the Executive Summary that is based on all of the individual contributions and describes the overall trends and drivers of variability and change in Puget Sound’s marine waters during 2014. The larger picture that emerges from this report helps the PSEMP Marine Waters Workgroup to (i) develop an inventory of the current monitoring programs in Puget Sound and determine how well these programs are meeting priority needs; (ii) update and expand the monitoring results reported in the Puget Sound Vital Sign indicators (http://www.psp.wa.gov/vitalsigns/index.php); and (iii) improve transparency, data sharing, and timely communication of relevant monitoring programs across participating entities. The Northwest Association of Networked Ocean Observing System (NANOOS), the regional arm of the U.S. Integrated Ocean Observing System (IOOS) for the Pacific Northwest, is working to increase regional access to marine data. Much of the marine data presented here and an inventory of monitoring assets can be found through the NANOOS web portal (http://www.nanoos.org). Full content from each contributor can be found after the executive summary, including website links to more detailed information and data. The Canadian ecosystem report “The State of the Ocean for the Pacific North Coast Integrated Management Area” (http://www.dfo-mpo.gc.ca/science/coe-cde/soto/ Pacific-North-eng.asp), encompasses approximately 102,000 km² from the edge of the continental shelf east to the British Columbia mainland and includes large portions of the Salish Sea. The annual report provides information that is also relevant for Puget Sound and is a recommended source of complementary information to this report. The Puget Sound Ecosystem Monitoring Program (PSEMP) is a collaboration of monitoring professionals, researchers, and data users from federal, tribal, state, and local government agencies, universities, non-governmental organizations, watershed groups, businesses, and private and volunteer groups. The objective of PSEMP is to create and support a collaborative, inclusive, and transparent approach to regional monitoring and assessment that builds upon and facilitates communication among the many monitoring programs and efforts operating in Puget Sound. PSEMP’s fundamental goal is to assess progress towards the recovery of the health of Puget Sound. The Marine Waters Workgroup is one of several technical workgroups operating under the PSEMP umbrella – with a specific focus on the inland marine waters of Puget Sound and the greater Salish Sea, including the oceanic, atmospheric, and terrestrial influences and drivers affecting the Sound. For more information about PSEMP and the Marine Waters Workgroup, please visit: https://sites. google.com/a/psemp.org/psemp/.